We’d love your help. Let us know what’s wrong with this preview of Product Leadership by Richard Banfield. To ask other readers questions about Product Leadership, please sign up. I was so excited for this book, but it turned out to be an absolute chore to read. The valuable insights were few and far between, the tone was lifeless, the structure was bizarre with lots of repetition, quotations from practitioners felt randomly thrown in. I'm lucky to live near the Pluralsight headquarters and have heard Nate Walkingshaw and other Pluralsight PMs speak about their processes. I got so much more insight from a one hour talk than from this entire book. There also is a level of I was so excited for this book, but it turned out to be an absolute chore to read. The valuable insights were few and far between, the tone was lifeless, the structure was bizarre with lots of repetition, quotations from practitioners felt randomly thrown in. I'm lucky to live near the Pluralsight headquarters and have heard Nate Walkingshaw and other Pluralsight PMs speak about their processes. I got so much more insight from a one hour talk than from this entire book. There also is a level of passion for their work which doesn't come through at all in these pages. 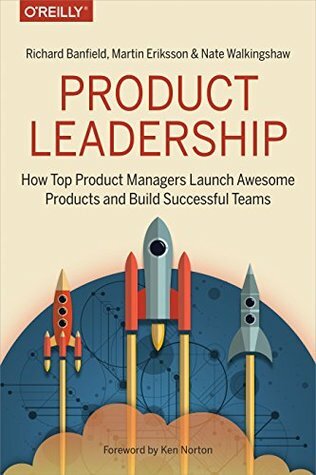 Product Leadership is the perfect companion to Marty Cagan's book Inspired (a PMs bible, read it if you haven't already). People new to product leadership will undoubtedly learn a lot from Product Leadership, and experienced product leaders will be inspired and learn a great deal as well. Great book on product that leaves out the jargon and fine details of what that really matters in the longer run. It is more of a career companion code book that you go back to refer to again to ensure you're roughly on the right track. What inspired me to read this book was interviews with more than 100 product managers and how they built awesome products. Unfortunately, this book didn’t live up to my expectation. More details down below but first some pros of the book. This book is good compilation of what product management is all about. It even takes it a step further to explain product leadership and share how it’s different from product management. If one is starting out in product management, this can be a good beginning What inspired me to read this book was interviews with more than 100 product managers and how they built awesome products. Unfortunately, this book didn’t live up to my expectation. More details down below but first some pros of the book. This book is good compilation of what product management is all about. It even takes it a step further to explain product leadership and share how it’s different from product management. If one is starting out in product management, this can be a good beginning point. Now on why I think this could have been better. First, there is nothing new in this book. If you have spent few years in product management and have read some books already (likes of Lean Startup, The Four Steps to the Epiphany, Hard things about hard things) or read/watched online stuff (likes of Sam Altman series), the only thing that this book serves is to refresh some of those concepts. Second, I felt that the writing style was too verbose, making it boring to read. Few ideas were repeated throughout the book. For example, part 2 of the book calls out how a PM is different across various organizational states, that is startup, emerging and enterprise, but there doesn’t seem to be much difference in the ways a PM would perform his job. Instead of this, exact difference in each of these would have been a better way of putting things together. Third, the USP of this book was interviews with more than 100 Product Managers. These interview snippets spread across the book seem to be just touching the surface with no real-life examples of why they feel so and/or any practical actionable items for readers. This makes all concepts and ideas look weak and half-cooked. Fourth, some of the concepts attributed to product leadership are true for general management. Example of these include, how to hire a team, buy vs build decisions, how to work with external partners etc. This book has many valuable notes and talks! It reviewed various teams and companies and interviewed with their leaders. Another part of the book is going through the basic of product management and partially UX. However, this book can be much better and deeper. For instance, it covers the metrics that product managers need to use in their product performance evaluation, but the details are not deep enough to give you a practical ground. This gets annoying sometimes while you reading the chapter This book has many valuable notes and talks! It reviewed various teams and companies and interviewed with their leaders. Another part of the book is going through the basic of product management and partially UX. Amazing book on product leadership and product management. Insightful, practical tips and guidelines drawn from industry leaders. The book genuinely inspired me to learn more about PM and seek out challenges to take it to the next level - Product Leadership! The ABC of product management. There are some bad reviews of this book. I understand some of the reasons, like the constant repetition of some concepts that are quite clear to understand. But the ones related to how these concepts can be already found in other places are not relevant to me. The main issue of this book is that the title and blurb generates some expectations that are not fully covered. Many of the chapters summarize what a product manager is. The ones that focus on actual product leadership are actually descrip There are some bad reviews of this book. I understand some of the reasons, like the constant repetition of some concepts that are quite clear to understand. But the ones related to how these concepts can be already found in other places are not relevant to me. The main issue of this book is that the title and blurb generates some expectations that are not fully covered. Many of the chapters summarize what a product manager is. The ones that focus on actual product leadership are actually descriptions of what a leader should do, regardless of whether she is a technical, project or product leader. Soft skills, who to hire, how to handle partnerships... are all treated in a way that is useful in this and other scenarios. The mark of a successful career advice/strategy book is how many pages I've folded the corner of to come back to later and there's lots in this volume on running Digital Product teams. Wide range of interviews and examples, my only criticism would be (and this based on personal need) wanting more on working enterprise/traditional orgs. For some reason, this book just didn't jived with me. One is definitely the overall quality of the paperback, structure and these weird black and white low quality photos?? And other one is the quality of writing, mental models this book is trying to create and its substance. Compare to something like https://strategyzer.com/books/value-p..., which oozes character and thoughful content. Half of Product Leadership is just absolutely basic observations on the industry, it seems more like a book for For some reason, this book just didn't jived with me. Half of Product Leadership is just absolutely basic observations on the industry, it seems more like a book for some CEO from a 00s trying to wrap their head around things, not a professional's handbook this is marketed to be. Around 40% of book's content are overviews on what's agile, waterfall, history of product marketing in the 60s, concepts like lean and usability testing. Jeez guys. Y-A-W-N! The "meat" of the book then are basically summaries from the few business leaders. These are all pretty forgettable companies and again, trivial facts of software development. I except you guys talk to Apple, 37Signals, Uber, Tesla.... Where's that Elon Musk interview? This is a waste of time for A LOT of money. Steer away. Wonderful overview of what it means to build software products and teams. First key point: the best product leaders tell a story about the product in the context of a customer’s success. Second key point: "Product Leads" are leaders and not just managers. Product Lead’s job is not to constantly manage or direct, but lead the team by clearly articulating the goals. They provide context (via customers, market landscape). I ❤ this! "Dream in years; plan in months; evaluate in weeks; ship daily." —DJ Pa Wonderful overview of what it means to build software products and teams. Unfortunately this book didn’t offer any interesting insights to me. The content is focused on the absolute basics of product management and general leadership. There’s a lot of repetition. Many of the quotes by product leaders aren’t very valuable, as they too are focused on the very basics of product leadership. I didn’t find interesting real world examples and anecdotes that I had hoped for. The book describes product leadership in a very abstract way. That results in abstract and shallow rec Unfortunately this book didn’t offer any interesting insights to me. The content is focused on the absolute basics of product management and general leadership. There’s a lot of repetition. Many of the quotes by product leaders aren’t very valuable, as they too are focused on the very basics of product leadership. I didn’t find interesting real world examples and anecdotes that I had hoped for. The book describes product leadership in a very abstract way. That results in abstract and shallow recommendations. I find it annoying how some howto-style books spend a lot of time explaining what they're going to tell you in the next section and chapters. It feels like it's dumbing down the content to a) tell you what you're about to be told; b) tell you; c) summarise what they just told you. That might be fine in a speech or verbal talk but it's tedious and unnecessary in print. At least for me. Maybe it does work though because this is an O'Reilly book and they are a successful publisher of this kind of c I find it annoying how some howto-style books spend a lot of time explaining what they're going to tell you in the next section and chapters. It feels like it's dumbing down the content to a) tell you what you're about to be told; b) tell you; c) summarise what they just told you. That might be fine in a speech or verbal talk but it's tedious and unnecessary in print. At least for me. Maybe it does work though because this is an O'Reilly book and they are a successful publisher of this kind of content. Aside from that stylistic issue, I found this book to be quite good at understanding ideal team structures and management approaches, but less helpful on the actual day to day of how a product manager should approach their role. There was a lot of high level discussion of what leadership vs execution looks like, and it also does a good job of separating stage specific advice for small, medium and large companies. I would have liked to see more in depth interviews from many of the expert product managers quoted, to learn more about their own experiences at the various companies. – Highly Collaborative: They know how to work effectively with others to move the company's missions forward. Their high level of empathy makes them great at understanding what motivates others and tapping into that to align everyone on the mission at hand. – Solid Communicator: Leaders, especially product leaders, need to be able to simplify and narrate stories. The business plan, the product vision, the company positioning, etc, are at the end of the day narratives that need to be told and evangelized. Leaders have to be able to do that effectively. – Inspiringly Motivator: Seeing beyond the existing product is one of every single leader's responsibilities. To get people to see that vision, a motivation and inspiration are key. I identify myself about leadership not being "officially recognized as part of the job" but being necessary. Ultimately, the job of the manager or leader is to get results through other people. I always felt somewhat uncomfortable in an organization, being either "a programmer" or "a lead developer" just because of that. My mindset is people who do the hard work should deserve the reward, so why is that the "leader" position is higher than the "doer"? I felt unco I identify myself about leadership not being "officially recognized as part of the job" but being necessary. An easy read, but at the end of the day did not feel that I took anything from this book. Also, the structure of the book did not make any sense and seemed like the author just tried to put together quotes of 100 PMs in one text without a clear narrative or goal what he wanted to achieve with the book. However, if you are new to the discipline, you will probably find some useful information and maybe the book will even be enjoyable. This book did a good job of identifying the balances one must seek as a Product Manager. The book incorporates a good chunk of real-world examples but I would have liked more examples and less theory. The biggest takeaway for me was their lists of questions to ask in certain scenarios. The book did a good job defining the qualities to look for in a Product Leader with loads of practical advice on how to hire. Simple and practical advice with many best practices for directions product review. I would love to find more detail on tactical execution practices, could be hissed inside of case studies. All in all, I can tell that will be referencing this content in the future, today is a good sign if value creation. It is great to see one of the first, if not the first, books on Product Leadership! Being certainly useful and extensive, it also feels a bit raw and unprocessed, and quite a difficult read. It could benefit from more drive and positivity, better organisation and less repetition. I have expected a lot more from this book and the overall hype around it. The writing was boring and the concepts got explained over and over again... and again. Maybe this book has something interesting for someone completely new to Product Management, at the same time I could not glean anything too insightful from this book. I liked the interview format used throughout the book. This gave me insights into how other companies are tackling product management issues. The book is well structured and certainly gives a lot of food for thought. I wouldn’t recommend this book if you are new to product management as the examples given will resonate better if you have experienced some of the situations yourself. Some great insights derived from real-world experience throughout, but large chunks felt poorly written. Either obvious typos or odd use of quotes that don't seem to fit with the point being made in the context around it. An exhaustive overview of how to ensemble a high performing product team and how to tackle all the challenges that might come along with building out new products. A def must-read book for everyone involved in digital product management. Goes through many useful frameworks and does a nice overview of things to think about leading a product team. Recommend taking notes to go apply pieces as you read. The values and principles outlined in this book were timely and poignant at this point in my product career. While at times it felt like some topics were explored in great detail at the expense of others, all in all I've pulled many insights from this book and expect to return to it regularly. In general, it has a lot of interesting content however because of the writing format it doesn’t really get deep into any of the topics it covers. At the end it feels more like an overall introduction to Product Management, which is nice but not what I was expecting from this book. Good insight into leadership as it pertains to working primarily in the scope of software products. Still some great nuggets of wisdom pertaining to general leadership as well and I definitely recommend it for anyone that currently leads or is learning to lead.